Not sure of the official name of this pattern. 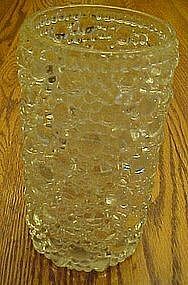 Large thick crystal clear large and small profusion of rounded bubbles all over the entire vase. Measures 6 3/4" tall, and opening is 3 1/2" across. This would look good with a candle in it also. Just imagine how the light would reflect. Perfect condition.